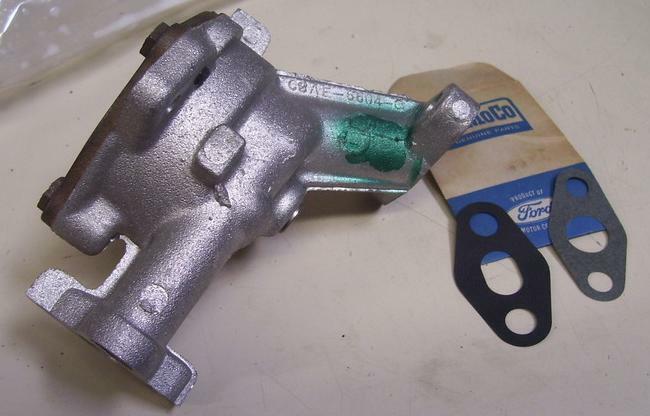 Ford identified the oil pump used in 428 CJ and SCJ engines using basic part number 6600. The 1975 Master Parts Catalog identifies the pump using service part number C9ZZ-6600-A. This pump replaced an earlier pump used during the 1968 model year that was identified by service part number C0AE-6600-C. The screen and cover assembly was sold separately under service part number C6OZ-6622-A. The pump body is made of cast aluminum. Ford appears to have used several different pump bodies for these pumps. The one pictured has an engineering number of C8AE-6604-C. I've seen reports of others marked C2AE-6604-A and C4AE-6604-C, all of which were also used in other applications. There are minor differences in the pump bodies that do not affect performance. The significant difference between applications is in the engine oil plunger and the pressure relief valve spring, which control flow rate and fluid pressure. The CJ/SCJ plunger is identified by service part number C1AE-6674-A. Royce Peterson reports that this plunger is approximately 2.59" long. The CJ/SCJ pressure relief valve spring used before 25 November 1968 is identified by service part number C4TZ-6670-A. The 1975 MPC reports this spring to be approximately 2" long. The pressure relief valve spring used after 25 November 1968 is identified by service part number C9ZZ-6670-A. The 1975 MPC reports this spring to be approximately 2 5/32" long. This particular pump also has an "SP" ink stamp on the bottom. 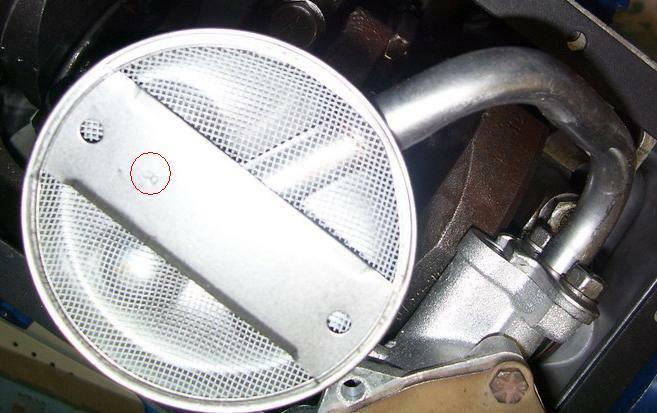 By now you've probably figured out that there's no easy way to uniquely identify this as a 428 CJ pump without being able to see the internal parts. I think that's a safe bet. The ink marks might be significant, but I can't say for sure. Ford rated this pump as flowing 22 gpm at 40-60 psi at 2,000 rpm. Some sources list the specs as 22 gpm at 70-80 psi at 4,000 rpm, but this seems high based on reported experiences with this pump. There is an "R" on the face of the screen (circled in red in the image above). There is also a date code (two-digit year with a month-dot clock) on the mounting flange. Thanks to Mark Haas for the pictures used here.